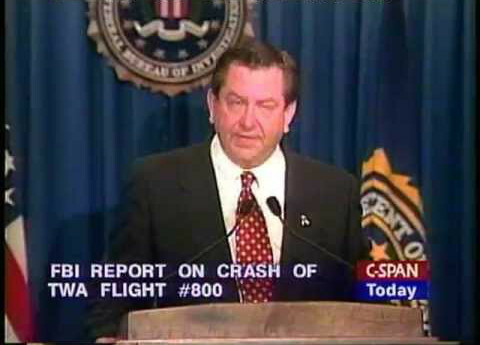 Sixteen months after TWA 800 fell from the sky in flames ten miles off the coast of Long Island, FBI Assistant Director James Kallstrom looked into the cameras at his final press conference and said there was absolutely “no evidence” of a criminal act. Seated before a congressional committee earlier that year, Kallstrom testified that no witness said they saw a missile. And more recently in 2013 on the Fox News Channel he said most witnesses to that fiery crash could not have seen a missile because they only looked to the sky after first hearing a loud explosion. (The sound from a missile exploding would take forty-five seconds to travel the ten miles to reach the witnesses onshore, and therefore the missile would have been, at best, an unrecognizable cloud by the time they looked up). He was wrong on every point. The FBI detected explosives in the wreckage and the National Transportation Safety Board (NTSB) documented dozens of high energy fractures. Many witnesses said they saw a missile and barely anyone heard a sound first. The official crash narrative has been defended by inaccurate and misleading statements like these for two decades now, and journalists have either repeated official pronouncements or remained on the sidelines. For a fleeting moment this week, TWA 800 will be in the news as its 20 year anniversary is upon us. CNN and the rest will recap how extensive the investigation was, remind us that some people say a missile was involved, and then undoubtedly prop back up Mr. Kallstrom or someone like him who’ll say those people are conspiracy theorists. But not everyone who challenges the official narrative can be so easily dismissed. Senior National Transportation Safety Board (NTSB) investigator Hank Hughes laid out the reconstruction grid for the jetliner and was a Group Chairman during the investigation. TWA Chief Safety Officer Captain Robert Young was TWA’s top investigator assigned to case. Former Suffolk County Medical Examiner Dr. Charles Wetli oversaw all victim autopsies. And Army Colonel Dennis Shanahan, M.D. was the NTSB’s medical forensic consultant. These and other former investigators became whistle-blowers when they sent a petition to the National Transportation Safety Board in 2013 with radar evidence indicating that high velocity debris traveled rightward with respect to the aircraft the moment it lost electrical power. They argue, convincingly, that this disproves the official theory of a low velocity and forward-venting fuel tank explosion. Journalists covering the crash can spend some late nights fact-checking the whistle-blowers’ claims or follow the lead of their predecessors and give Kallstrom or the government the final word without fact-checking. That choice is made easier when remembering that siding with the whistle-blowers’ could get you branded with the career threatening conspiracy theorist label. Without addressing the evidence, ABC’s Brian Ross dismissed the whistle-blowers on live TV while news of their claims was breaking. He said it “would have to be one of the largest cover-ups in the history of this country involving the FBI and every other major agency” involved. This type of conspiracy-admonishing thought is attractive, especially to journalists wishing to get home in time for dinner, but in this case, it’s akin to saying the faulty pre-Iraq-war intelligence was one of the largest misinformation efforts in this country. Both efforts were contaminated by a few at the top, not the many in the rank and file. When career intelligence officials didn’t link Iraq with Al Qaeda after the 9/11 attacks, the Bush Administration created the Office of Special Plans at the Pentagon. That office made the link, which was, according to the DoD Inspector General, “inconsistent with the consensus of the Intelligence Community”. Similarly, when career FBI investigators concluded that the TWA 800 witnesses saw a missile, top officials brought in a small CIA team overseen by Agency Director George Tenet, before he became known as “slam dunk” Tenet for his role promoting faulty weapons intelligence for war. That CIA team produced a video containing the underlined words “Not A Missile”, which aired at the press conference where Kallstrom looked into the cameras saying there was no evidence of a criminal act. The radar evidence dovetails with the witness observations of an object rising off the surface, turning outbound toward the jetliner, and exploding near it. The object’s final trajectory and explosion matches the radar evidence of high velocity debris heading outbound (rightward with respect to the aircraft) just as TWA 800 lost electrical power. These witness observations are inconsistent with the official crash sequence, just as the NTSB determined “38 witnesses [who] described a streak of light rising straight up or nearly so” are. But witness evidence is, well, witness evidence. Radar evidence is on an entirely different footing. Radar evidence shares the same type of statistical confidence that scientists rely on to announce the discovery of new elementary particles. A year before the TWA 800 whistle-blowers announced their findings, scientists at the Large Hadron Collider in Switzerland announced the discovery of the Higgs boson with “5-sigma” or 99.99997 % confidence. The whistle-blowers highlighted a single radar data point with much higher certainty that it was not any part of the TWA 800 aircraft that the NTSB simulated. And there were more than 50 data points confirming that one. This means it’s far more likely that the NTSB theory is wrong than that the Higgs boson exists. After a year of review, the NTSB responded to the whistle-blowers by releasing a document as misleading as Mr. Kallstrom’s statements. The NTSB referenced irrelevant “scatter” (uncertainty) in data from multiple facilities. If applied to the petitioners’ calculations, that scatter would drop the radar data’s confidence down to 1-sigma (68%) or lower. However, such scatter among multiple facilities doesn’t apply since the whistle-blowers used data from a single facility without the large uncertainty inherent in mixed data sets. Had the NTSB conducted the required statistical analysis, they could have confirmed the data’s high confidence level, but for whatever reason, the NTSB decided against performing that analysis. At this year’s White House Correspondence Dinner, President Obama joked about investigative journalists’ lack of resources “to chase down the truth and hold the powerful accountable.” It was funny and disturbing. But regardless of whether the joke was based on reality, it’s not necessary to chase down the truth here. The radar data has already been chased down and it’s clear. In short order, a journalist could verify that it both refutes the official theory and supports a missile engagement that was widely reported by civilian and military witnesses alike. This is where serious journalists have to consider carefully how to frame this story and understand that their role in our democracy should supersede any concern over the conspiracy label. It’s been 20 years. The rather obvious official falsehoods regarding this crash continually repeated over two decades have no place in this age, where the public is awakening to the establishment’s undue influence over narratives that take us to war and defend our institutions that openly engage in malfeasance.